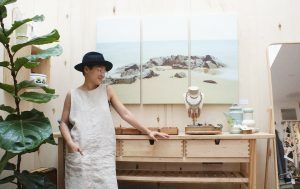 Shopkeeper Regina Sheung of Labour of Love making last-minute arrangements before opening. “…I don’t think there’s any hiding that we, as people, are the epitome of chaos. 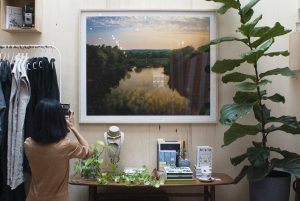 Curated by Regina Sheung, owner of Labour of Love, the fine art photographer of Lori Ryerson and Steve Kean captured just that – the chaos, and the magic. Tammy from Partial’s Creative + Community team snaps some Instagram content – featuring “Pastoral River” by Steve Kean. 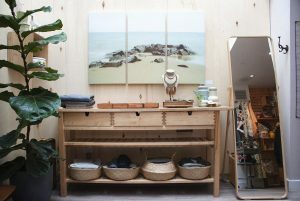 Steve Kean’s beautiful centrepiece of the trunk show drew all those who entered the boutique right into the Art Nook in the back… an right into its stunning world. The story behind the piece is amazing, too: this photo was captured on Steve’s Fuji camera. Right after he snapped this photo, his Fuji broke. One might say that this truly is the photo to end all photos. “Pastoral River” by Steve Kean is available for $110/month or $2,200 to own. Details here. Striking a pose in front of a triptych, “Soft Rock” by Lori Ryerson. This triptych shows how a large piece that is quite unique in its production can come across simple, soothing, and easy. The colour palette and the energy fit right in with the minimalist and soft aesthetic of the clothing. “Soft Rock” by Lori Ryerson is available for $85/month or $1700 to own. More details here. 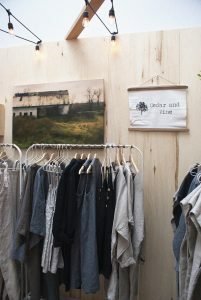 “Barn With Swaying Grass” by Steve Kean and clothing by Cedar and Vine. “Barn with Swaying Grass” (shown above) by Steve Kean is, amazingly, captured on his cell phone while Steve was on a moving train. Steve describes himself as both a disabled photographer and a photographer with a disability; the world around him is not created for his life in a wheelchair. While going on shooting trips, he cannot easily hop on and off trains. As such, he captures the world whizzing by from the window of the train. 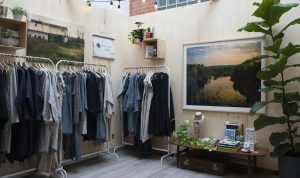 A view of the ‘Cedar and Vine’ trunk show and the art that accompanied it to transform the space. See more of Steve and Lori‘s stunning photography on Partial, and catch Lori Ryerson’s work on now at Overzealous 2018. 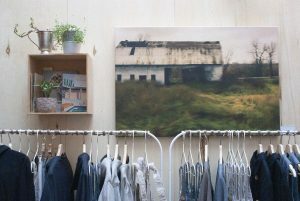 Do you have a retail or hospitality brick-and-mortar space looking to display local artwork in Toronto? If so, find out about our unique retail program that’ll bring original artwork to your walls. 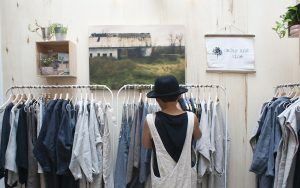 E-mail us at hello@partial.gallery with the subject line: “Retail Gallery Program”.